How can we reconcile our relationship with the circle of life and contribute to the regeneration of our living earth and global future? Our first event in the series will take place at St Ethelburga’s Centre for Reconciliation & Peace. Contributors include Jack Harries, environmental filmmaker, Liz Hosken, Director at Gaia Foundation and Lily Hunter-Green, musician and performance artist. The evening is curated around the sharing of a celebratory three course meal, intertwined with film, music, talks and discussion. For full details about the food and programme, see below. Join us for a journey into Spring, and the return of song. Alongside the food menu, each stage of the meal will also be accompanied with a menu of prompts, including a simple invitation of practices, questions or reflective exercises to explore in small groups connecting to the themes of the evening. 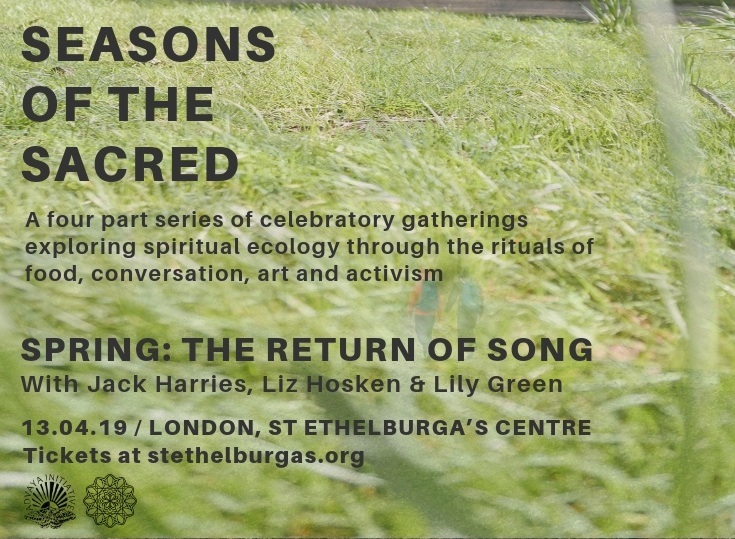 In the spirit of community and celebration, and combining the rituals of food, conversation, art and activism, Seasons of the Sacred events seek to offer an experiential exploration into the meeting point of the ancient and emergent. This meeting point is a place where lies the potential for a new story to be lived. An ancient story that reminds us of our place in the circle of life and the sacred nature of our earth. However, this story is also emerging anew; in response to this moment of global crisis. Much of the work of regeneration is being lead by the younger generations. This ancient story seeks expression in new ways, how can we participate in this unfolding? To explore these questions, each event will be tied to the primal cycle of the four seasons, encompassing different themes, and connecting the outer and inner landscapes of soil together with soul. The experience will unfold around a celebratory three course menu. Each dish will correspond with the season, themes and contributors of the night. What does each season, and this particular time of year, taste, look, smell and feel like? How can it help us to reconnect with the circle of life? With a poetic approach, the various dishes offer a shared experience and an opportunity to bring us more deeply into relationship with each other, our earth and the sacred. Cultivate community and be nourished by time with other young people from diverse fields working in service to the future. Immerse in an experiential exploration of spiritual ecology; bridging inspiration, art, dialogue and practice. Encounter the work of filmmakers, activists, storytellers, innovators, ecologists, musicians and more. Celebrate the beauty, wonder and mystery of creation and love for our living earth. Lily Hunter Green is a UK-based contemporary composer and visual artist. She has two key focuses in her work: the environment and marginality. Lily has exhibited her work nationally and internationally, including SNAP EXHIBITION (Aldeburgh), Sadler’s Wells Theatre (London) through to 516 ARTS (Albuquerque, US). Lily recently completed an Artist Residency at the Gurdon Institute, University of Cambridge. She is currently Artist-in-Residence and Associate Research Fellow at Birkbeck, University of London. Lily will be sharing ‘Bee Composed’, an environmental-based installation, which involved composing with the sounds harvested from live bees living in a redundant piano. This piece was developed to help raise awareness of the plight of bees, and the impact of their decline. Liz Hosken was born in South Africa and was active from a young age in both environmental issues and the anti-apartheid movement. In the mid 80’s Liz co-founded The Gaia Foundation, based in the UK. During the first decade of Gaia’s work Liz spent many years in the Amazon, where she was “initiated” into indigenous ways of seeing the world, which resonated with her own. Together with partners and indigenous communities, they developed a methodology for accompanying communities to revive their indigenous knowledge and practices. When Liz returned to her continent she was inspired to share these lessons and search for ways to restore Africa’s rich cultural, spiritual and ecological heritage. Liz now teaches the philosophy and practice of this approach, which is rooted in experiential learning and Earth Jurisprudence. She has a BSc in Environmental Sciences and a Masters in Philosophy and Education for Social Change. Vilma is a London-based artist and food experience designer. She creates menus, meals, installations and workshops that explore how food and eating can form dialogues between human and natural world, and nurture more imaginative, caring and sustainable ways of coexistence. Her work explores the healing properties of food, and how rituals of eating can put us back in touch with nature and its rhythms. Vilma is interested in the psychological and spiritual dimensions of sustainable development. Any lasting behavioural change must start from within ourselves, how we feel and think about food and its origins, and our position within the natural world. That’s why stories, art, creativity, imagination, play, beauty and poetry are vital if we are to make food sacred again. She holds a masters degree in Narrative Environments from Central Saint Martins. and have previously worked with The Center for Genomic Gastronomy, National Trust, V&A, Rocket Food, Wellcome Collection, The Collective, Vision Forum, London Design Festival amongst others. Spiritual ecology is both an ancient and newly emerging field, and an aspect of our work that we are exploring in relation to building a global culture of peace, which includes learning to live in peace with our Earth. It brings together ecology and environmentalism with a deeper awareness of nature as alive, as animate, and as sacred. Spiritual Ecology is not based upon any single religion or spiritual path, but rather points to the primary and universal recognition of the sacred nature within creation. It proposes that at this time of ecological unravelling, spiritual values have the potential to provide the foundation from which to respond and rebuild. – Opportunity in crisis: The ecological crisis of our time presents us with an unprecedented opportunity to transform our relationships with each-other and the natural world, moving into a lived recognition of our interconnectedness. – Collaborating across differences: With a recognition of our interconnectedness, we urgently need to move beyond of differences of nations, identities, race, religion etc., and work together in service to life. – Protecting the sacred: Spiritual ecology offers a worldview rooted in a recognition of the sacredness of the earth and all life. How can we root our activism in this deeper relationship? – Spiritual values into action: Real regeneration and change requires us to unite spiritual values and practice with practical action, and this understanding forms the basis of all of our work and programmes.